Two days until Thanksgiving and just three until the panic ensues and everyone realizes there’s just 26 days until Christmas! To help you stave off the panic here are two local events I’d highly recommend; one east and one west! Cheers!! Shoppers will be delighted by the unique gifts and DIY craft workshops from more than a dozen craft vendors curated by Cleveland Craft Connection, set up in a space decorated for the season at Lucy’s Sweet Surrender. Different vendors will be featured every week! Taste buds will be tickled by the offerings from Cleveland Culinary Launch and Kitchen, which will transform the café space in Juma Gallery, Shaker location, into a food marketplace featuring food demonstrations and edible treats for purchase. To further enhance the shopping experience, Shop the Window will fill a vacant storefront between Lucy’s and Juma Gallery with gifts curated by Upcycle St. Clair,including some created by Shaker residents and artists. With a QR scanner downloaded for free on a smartphone, shoppers can stroll by and purchase a gift at any time just by scanning the code. 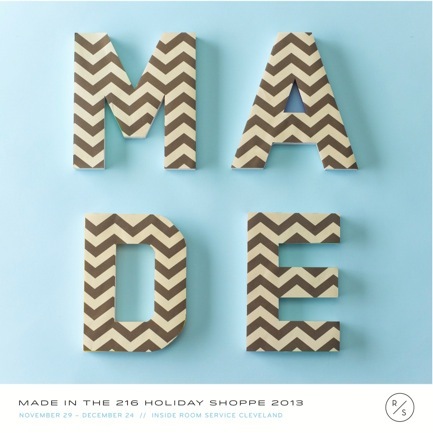 MADE IN THE 216 HOLIDAY SHOPPE is a retail event and shopping experience designed to tout the design community of Cleveland and to support those that have chosen to stay and base their creative endeavors right here in ‘the 216’. By showcasing the designers along with musicians and caterers in a setting merchandised and designed to look like a fun and engaging retail space, you are encouraged to explore and discover the products and shop and have fun! All of your gift giving bases covered- from apparel and home goods to cards, jewelry and kids gifts; come see what they have in store for you this season!! The Holiday Shoppe is located within Room Service down in Ohio City. Kick off party goes down Black Friday, November 29th at 4pm with DJ Peter Pleasurecruise, and fittingly, local beer specially for MADE!! Looking for more fun? The party continues at Duck Island Club ( just a hop skip and a jump down the street! ).